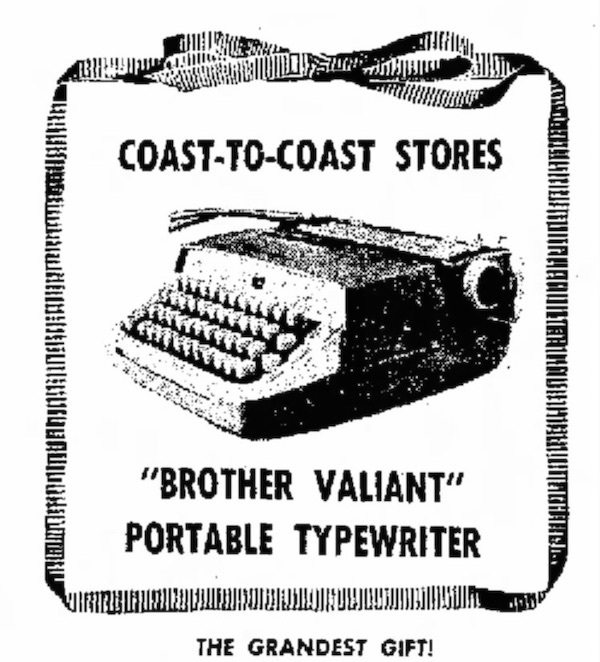 Brother Industries, a sewing machine company, entered the typewriter market in 1961, but soon, it was a dominant force, selling some 10 million typewriters by the 1980s, and tens of millions of manual and electric typewriters by the 1990s.1 Among collectors, the Brother is the least rare machine one can find. 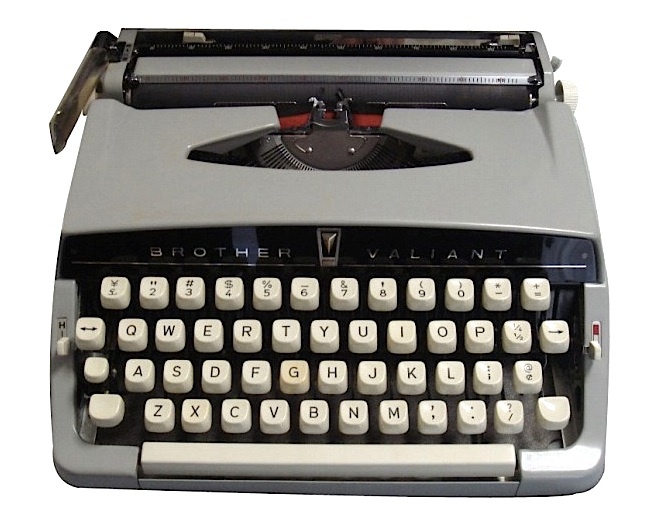 Yet, standing uniquely among the millions of these machines, are the very first Brothers: the Valiant, the Wizard Truetype2, and the Bradford, all of which were introduced late in 1961. The machines in my collection have serial numbers of P111299 (the Valiant) and P149534 (the Bradford), indicating each was made sometime in 1961. I’ve also located a Wizard Truetype from that year; it’s serial number is P125018. The “P” prefix is unique in that it falls outside the normal numbering convention. 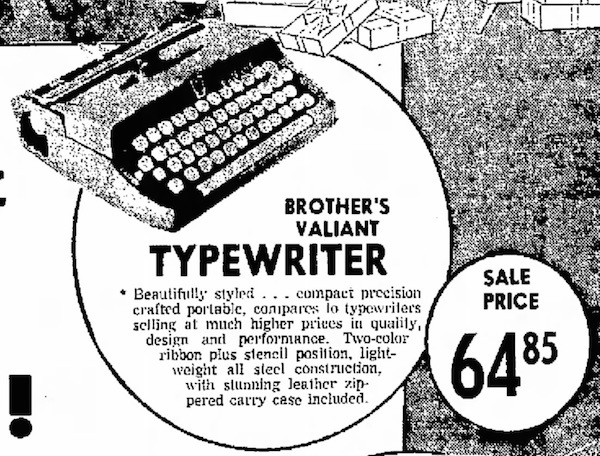 You can read about Brother serial numbers at TypewriterDatabase.com. As these machines are the only ones displaying a “P” prefix, I surmise this designation applies only to machines manufactured in 1961. 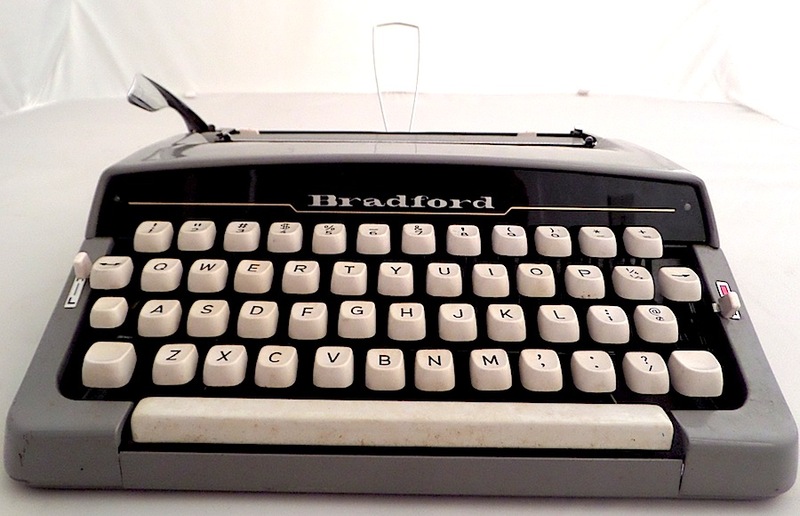 The Bradford was sold from 1961 and 1967,5 but exclusively at W.T. 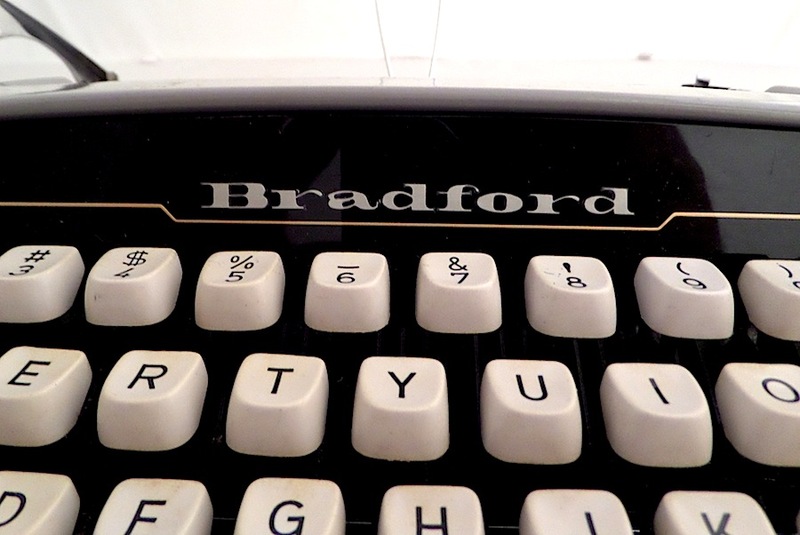 Grants, which employed “Bradford” as its unique mark. See post here. 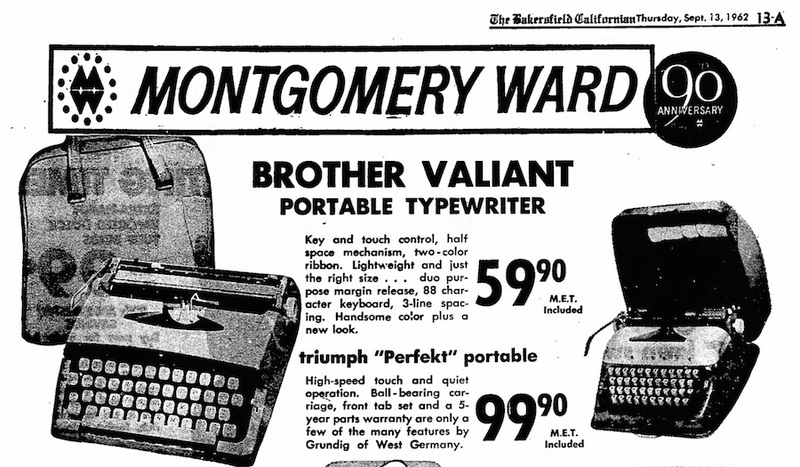 In 1963, Montgomery Ward introduced its own line of Brothers under the Signature label. See here. 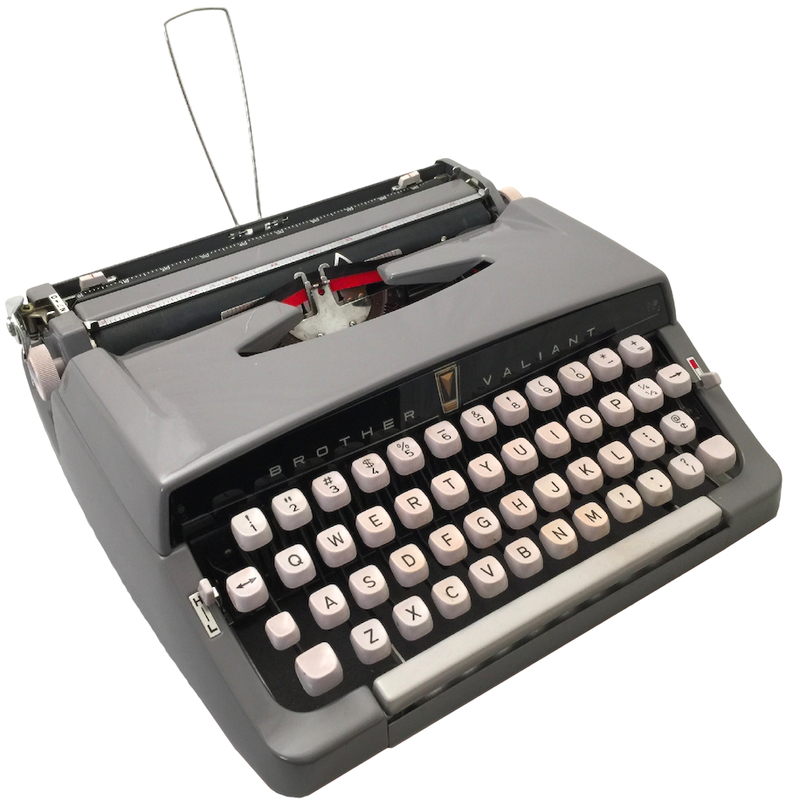 The period between 1961 and 1963 is unique in that Brother was only just establishing itself as a typewriter manufacturer. 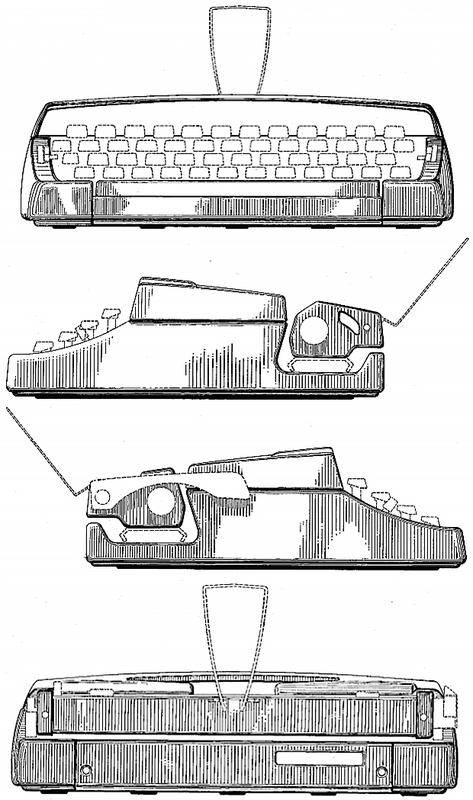 Its primary machine was an early version of the JP-1, which is easily identified by its wire paper rest. 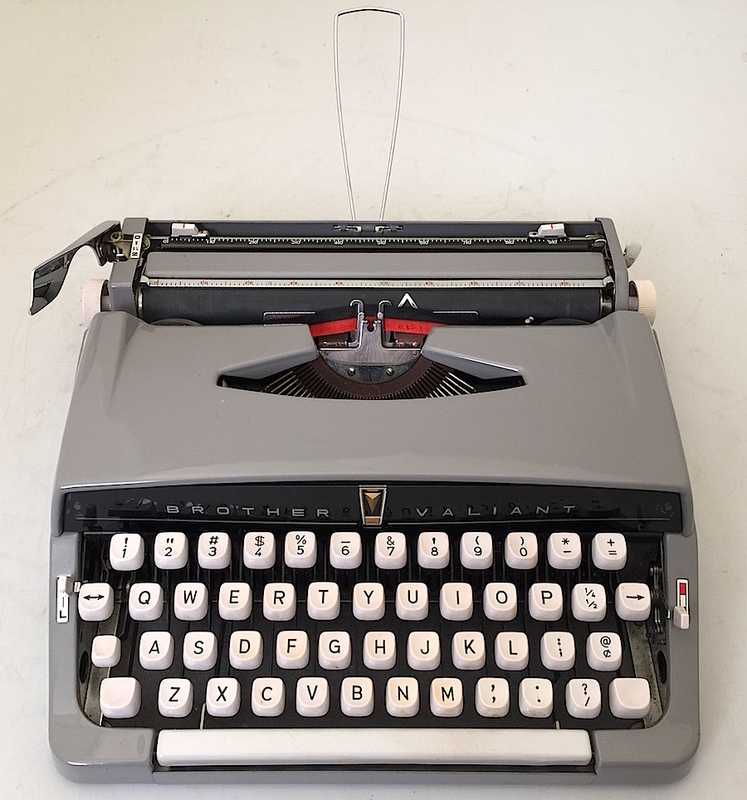 Sometime late in 1963 or early 1964, Brother introduced a different style of paper rest, a straight piece of metal that folded into the carriage. The last advertisements found for the Valiant date to mid-1966. Sleek profile, dashboard faceplate, wire paper rest. The original patent can be viewed here. Distinctive nameplate with “dashboard” styling. The emblem is gold, but on other machines sometimes red or white. 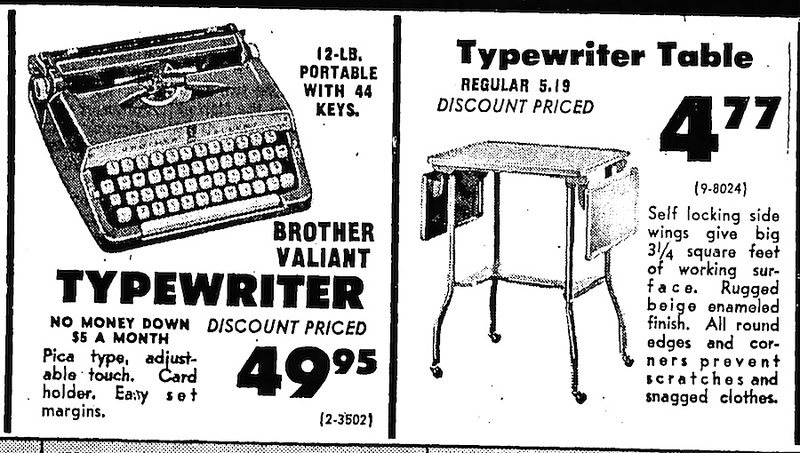 Brother typewriters are sturdy. At just over 50 years old, this machine types well. Ryan Adney displays a 1962 Valiant at TypewriterDatabase.com here. A Japanese-language site designates this Valiant as a JP1-121. Notice that the wire paper rest is absent; in its place is a retractable metal paper rest. See site here. This is a valiant machine, too. 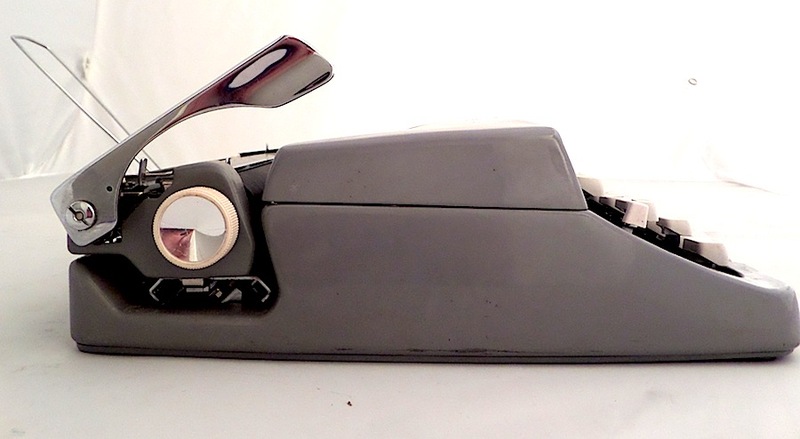 A budget machine, which likely sold for around $36. 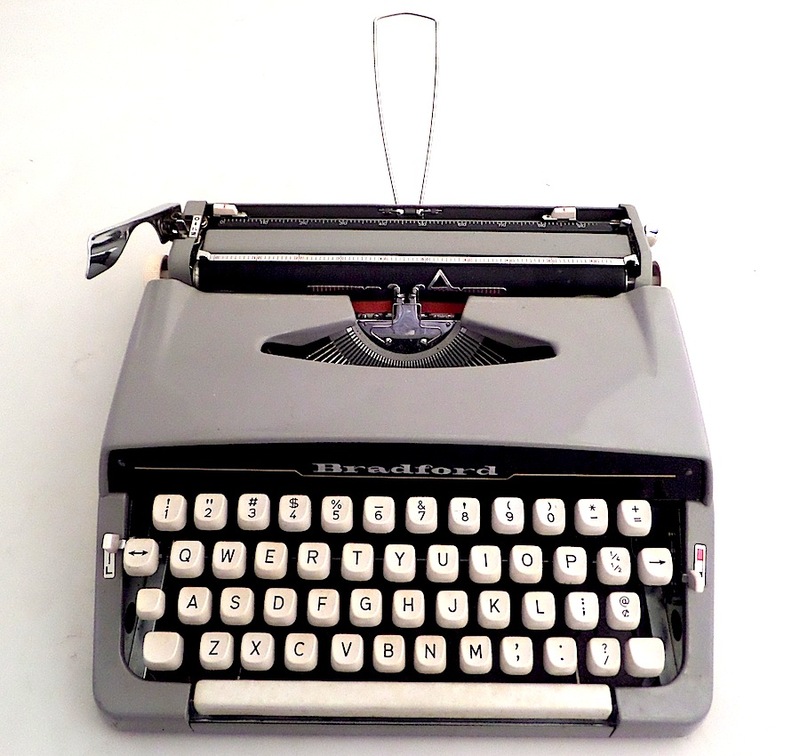 Brother originally manufactured sewing machines, and the various names of those products sometimes were applied to the various lines of its typewriters. From the Janesville Daily Gazette (Janesville, Wisconsin) Oct. 16, 1961. 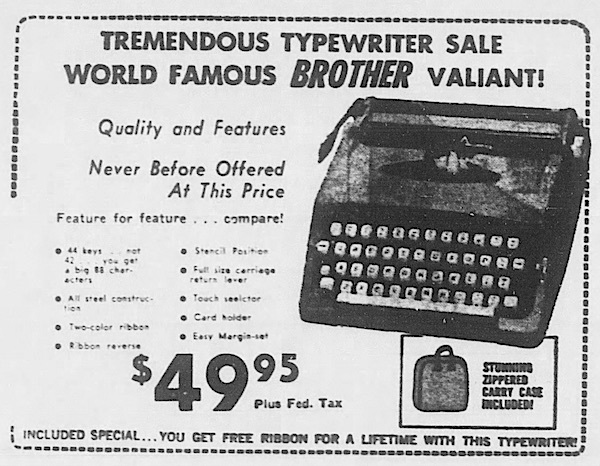 The earliest advertisement for a Brother typewriter dates to late 1961, the year Brother introduced its soon-to-become iconic machines to North America. 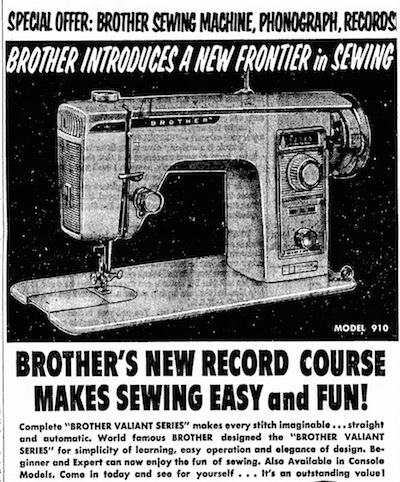 The earliest retailers to market Brother machines seem to be Gambles and W.T. Grants. This ad was placed by Gambles. From The Daily Republic (Mitchell, South Dakota) Dec. 19, 1961. Placed by McMahans. Note the wire paper rest. From The Yuma Daily Sun (Yuma, Arizona) June 10, 1962. 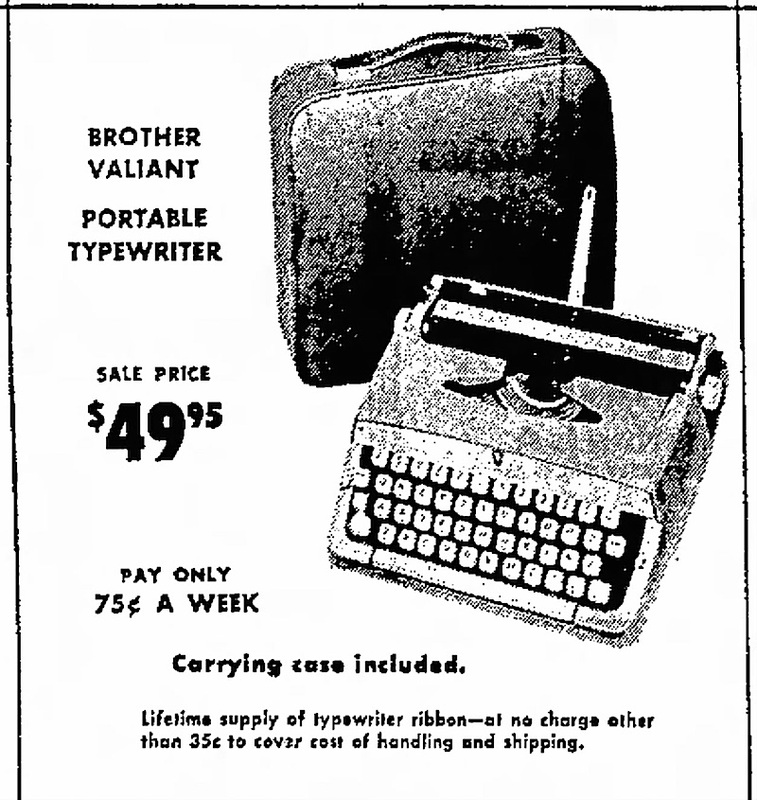 In 1963, Montgomery Ward would sell a Brother typewriter under the “Signature” label. 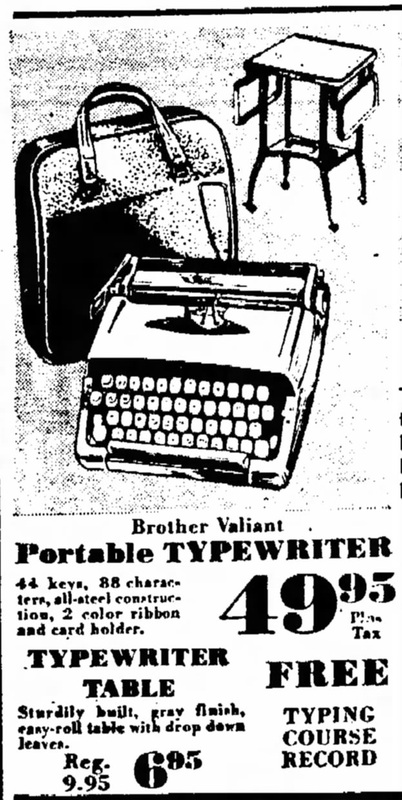 But, initially, Wards sold the Brother Valiant. From the Bakersfield Californian (Bakersfield, California) Sept. 13, 1962. A Bradford, sold by W.T. Grants. 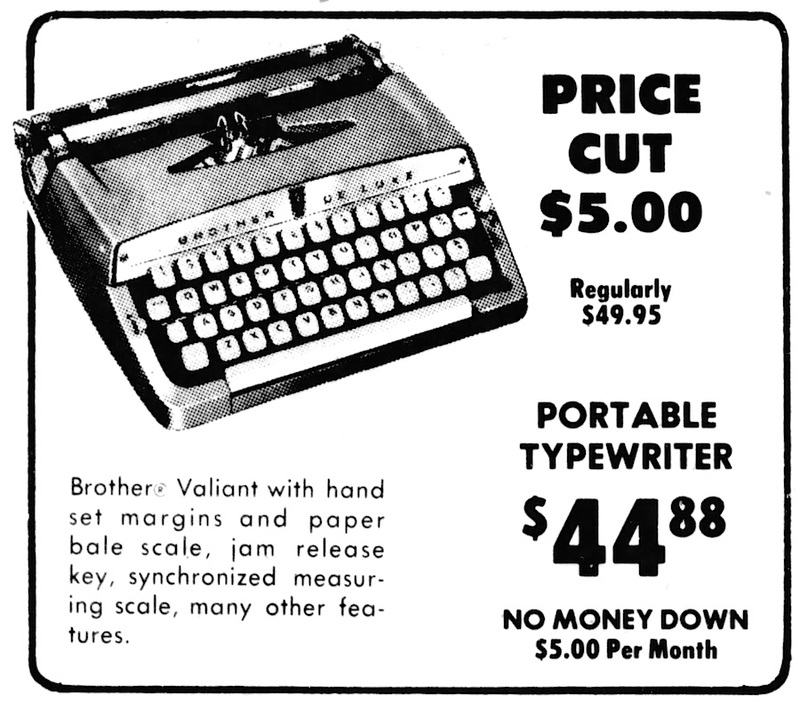 From a 1963 advertisement. Note wire paper rest. Grants “own” Bradford — just like everyone else’s! From the Oregon Statesman (Salem, Oregon) Sept. 8, 1963. Hard to tell in this image, but soon Brother would drop the wire paper rest for a short metal paper rest. Placed by King Soopers in the Colorado Springs Gazette-Telegraph (Colorado Springs, Colorado) Sept. 6, 1963. This is the more deluxe version of the Valiant, which is slightly larger and more fully featured. (See comments section below, not a Brother, though the store probably sold a Brother, just placed the wrong image in advertisement.) From the Ironwood Daily Globe (Ironwood, Michigan) Dec. 17, 1963. New paper rest. From the Fresno Bee The Republican (Fresno, California) Aug. 27, 1964. 1964 advertisement, probably using old clip art. From the Post-Crescent (Appleton, Wisconsin) Nov. 18, 1964. Advertisement placed by Cussins and Fearn Stores. 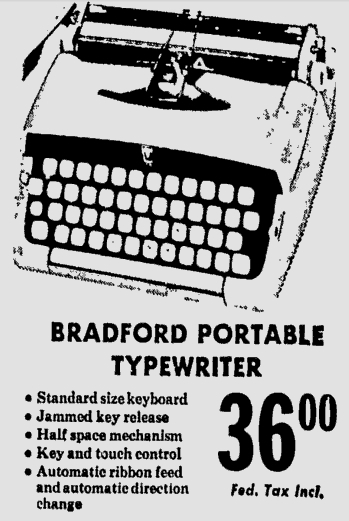 From the Sandusky Register (Sandusky, Ohio) Sept. 9, 1965. Brother Valiant? Look at the faceplate. Munk, what do you make of the JP1-111 designation found here and here? I dunno. it seems clear that the model you have here (the first JP-1 iteration) is a JP-1-111 according to Brother, and there are many other iterations mentioned on the second page, but the Service and Parts manuals don’t seem to make mention of those designations. Duly noted. It didn’t look right, but I’m still awaiting my new glasses! There’s that famous episode where Crawford flips out at Buckeye Mart. Ugly. Those early Brothers really are nicely styled little machines. Are you keeping a list of all the 3-digit sub-model codes you’ve found? (JP-111, JP-121, etc?) When you feel you have a handful or so of confirmed ones, let me know and I’ll add those as well in a special section. If nothing else, it seems to indicate a sort of order to the model production. That’s an important find. Please send photo to netadams @ gmail. 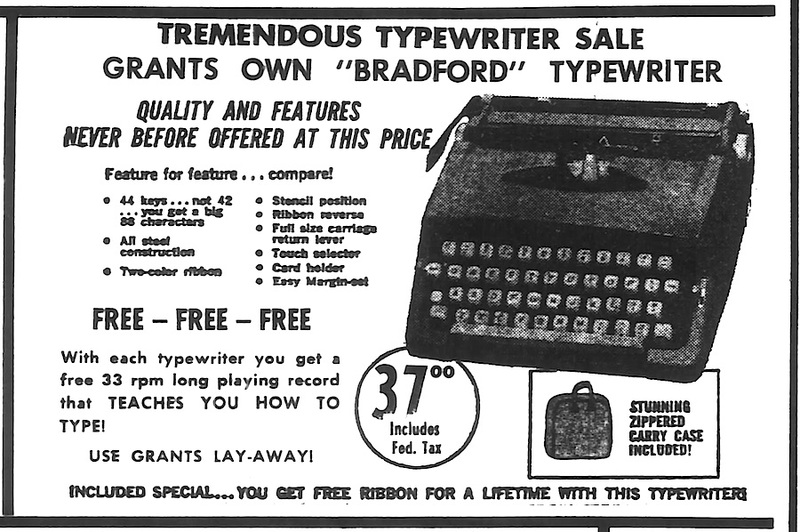 Also, try posting at TypewriterDatabase.com. I’ve never seen a foreign Brother from that year. Good find.